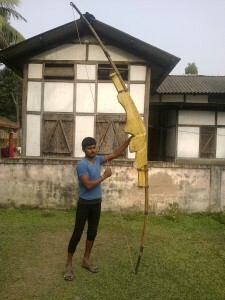 Ganesh Bora (born on January 17, 1984) of Assam, India, had created the biggest bow of height 12.5ft and weight 30kg. The arrow of the set is 4.5ft long and can be shot with the bow. Comments for LONGEST BOW are now closed.